BUGS BUNNY ON CROSSCURRENTS, 7/27 – Doggedly Yours… Howling, Humor, and History. BUGS BUNNY ON CROSSCURRENTS, 7/27: The cunning, jesting, carrot-eating rabbit, Bugs Bunny, debuted in the Warner Bros. short film “A Wild Hare,” on this date in 1940. 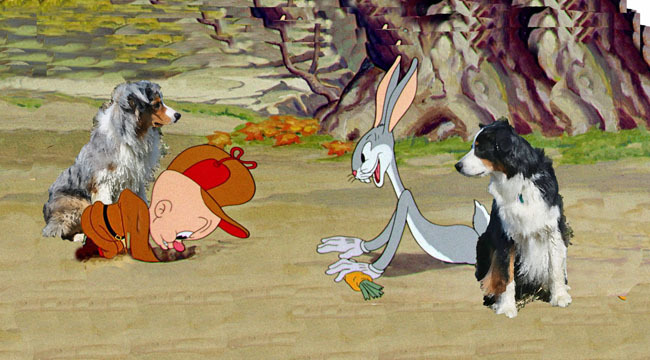 Gavin and Wyatt attempt to moderate a skirmish between the wile rabbit Bugs and his hunting antagonist Elmer Fudd. You can answer the wabbit’s question “What’s up, Doc?” by listening to John’s looney-tunes on Crosscurrents, 7/27 at 8 a.m.